Buying homeowners insurance is a necessity particularly where I live. I live in southern California where the next big earthquake is days/weeks/months/years away! A natural disaster that can wipe you out financially!. I survived the Northridge earthquake without damage, but that was just luck. California has a 99% chance of a big earthquake within thirty (30) years. My current insurance carrier stopped offering earthquake coverage this year! I had about five (5) to six (6) weeks to find another insurance carrier that had earthquake coverage. 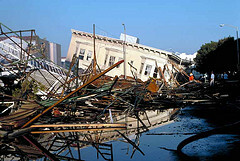 The state of California offers earthquake coverage, but you have to fit the coverage offered and it is not cheap. I prefer to have coverage through traditional insurance companies. It is getting harder and harder to find an insurance company that offers earthquake coverage. It is not a question of financial strength, but getting the right coverage for a reasonable price. I looked for coverage in all the traditional and nontraditional ways. I contacted my insurance broker who is with the largest insurance agency in Los Angeles. This tactic worked very well four (4) years ago! Apparently, the market has changed and I had practically no choices. I checked with one of my neighbors who is an insurance broker and he gave me a quote. Southern California is a huge market, but very few companies want to insure for earthquake coverage. As with most policies, there are areas where the insurance company places limits on coverage. What should a frugal (cheap) person to do? I kept researching on and offline for a solution. I knew I always had a choice to use California Earthquake Authority (CEA) for coverage. Last time , I was at the book store, I noticed that Consumer Reports published a survey of insurance customer satisfaction. Whether you realize it or not, You want the best insurance coverage at the most reasonable cost. Most importantly, you want a company that will be there if there is a claim. More than that, you want them to pay based on what the policy promised! This what we call a real life problem solving situation! It is not some arbitrary problem in a book or math class, instead it is real life and it costs money. If you are not careful, it can cost you a great deal of money at the worst possible time when you have a loss. In addition, insurance and similar expenses are something you need every year. For most people, a home is their biggest asset and you want to protect it. I think it is very important to identify the problem in detail and look for the solution in any problem solving activity. These are some of the steps I used to buy homeowner’s insurance. The top two (2) home insurance companies based on customer satisfaction were Amica and USAA insurance. I never heard of Amica and I already had a quote from USAA. I researched Amica and found out it was a 105 year old company rated A++ (superior) by A.M. Best. The customer survey rated it first at 95% satisfaction. This is just the kind of company I wanted in the event of a disaster! I completed the information online and received an immediate quote, but I had questions. I wanted to know if they had loss assessment and other coverage. I live in a townhouse which is part of a Homeowners Association (HOA). If there is an earthquake, there will be a deductible to be satisfied! I am the treasurer of my HOA and the deductible would be a special assessment to each homeowner. Last time (94 earthquake) it was $17,000. I want to make sure I had sufficient loss assessment to protect me from a special assessment and I wanted loss of use coverage. Loss of use is coverage for living expenses while you home is being rebuilt. Last time, the owners had to move out for a year. I compared my two (2) quotes and made a decision! When buying homeowner’s insurance, you should consider structure values, personal property coverage, liability, additional coverage for specific risks, and deductibles. Homeowner’s insurance protects against most risks such as fire, theft and some weather conditions. Coverage includes dwelling (repair or rebuild), personal property (furniture, clothes, electronics, appliances. damaged or destroyed? ), loss of use (additional housing/living expenses while home is restored), liability coverage (protect assets & cover defense costs in a lawsuit) and additional insurance (specific coverage such as jewelry/art). Additional considerations should include replacement cost vs. actual cost value coverage, property limits and deductibles. Your insurance broker should be helpful, but these are your decisions. Buying insurance starts with quality insurance companies because you want to be satisfied with the results. There are differences between insurance companies and it may not be obvious. Large companies do not mean they are any better than others. The most expensive coverage is not necessarily better than the cheapest coverage. I have shopped for insurance often for my personal needs, business and as CFO for corporations. As I said, I tried all the traditional and nontraditional ways to find the best coverage at a reasonable price. To my surprise the best solution was using a customer satisfaction survey to get insurance quotes. I went with Amica Mutual Insurance Company because they offered the best price and had the highest customer satisfaction (95%) rate. Buying homeowners insurance is necessary in southern California and I am satisfied!